Ford salesperson – Started selling in Dec. 2017 and averaged 8 before class in June 2018. He ended at 16 in June, 17 in July and 13 out by mid-August. His down payment average went from $1,000 to $3,200 and he doubled his income. Chevrolet – He’d sold for 2 years and was averaging 12. By August his average jumped to 23 and his commission went to $500 per unit (wow). Ford – Still new, averaging 7 before the workshop. Mid-August with 12 out already. 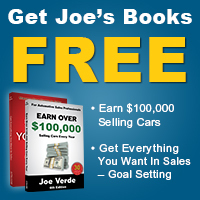 Said Joe’s 8 steps to the sale really opened his eyes to exactly what he was supposed to do out on the lot. 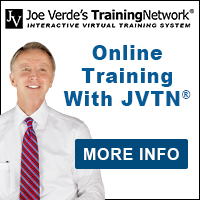 Chevrolet – He was the lot attendant and trained on JVTN® the last couple of months. Started selling and sold 17 in June, 18 in July and mid-month in August, he’s on track for 20. Imagine how life would change for you and your family if you doubled your sales and income, too. You have to go to work either way, so why not just learn more and earn more?